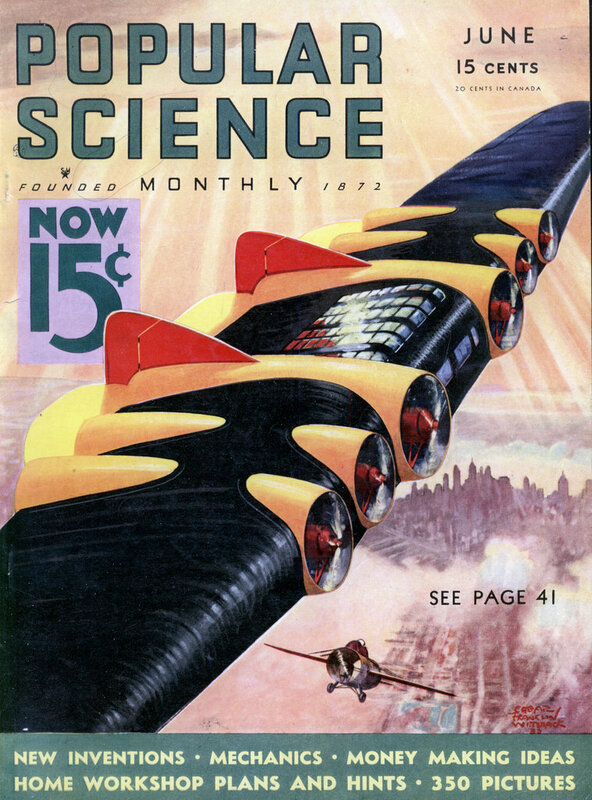 ACCOMPLISHMENTS of United States Government scientists, during the past one hundred years, will be revealed by impressive exhibits at the Century of Progress exposition which opens at Chicago next month. A building of unusual design, decorated in bizarre color combinations, will house the remarkable display. No scientific or technical exhibit ever set up exceeded in scope, variety, splendor, and magnitude the continuous performance Uncle Sam will stage in this windowless Federal Building with its trio of sky-pointing towers representing the executive, judicial, and legislative branches of our government. At a time when Washington bureaus and offices are undergoing severe financial curtailment, when all costs of government operation are being pruned to the quick, Uncle Sam has to don his formal finery and show his wares. Let no one make the charge that participation in this exposition is a waste of national funds in a time of need. It is, on the contrary, a vindication of the unending and unavoidable costs of government, for the government exhibits demonstrate exactly how the nation pays enormous dividends, in its essential services to the general public, for the many millions of tax dollars collected annually. One authority has described the Century of Progress as a symbol of industrial confidence. Although the exposition is being put on at a time of commercial and financial stress, nine million dollars of the ten millions in bonds to finance the fair have been sold. Financial magic was worked at a time when general prosperity was at low ebb. The exposition was planned several years ago in celebration of Chicago’s one hundredth birthday. Nineteen foreign countries, forty-four states, and the Federal Government accepted invitations to be represented, and despite hard times $25,000,-000 has been spent on the big fair. Chicago hopes to entertain 25,000,000 visitors during the show season from June until November, one for each dollar invested in buildings. One of the most striking of the government exhibits is a colorful reproduction of Mt. Rainier in Mt. Rainier National Park, down whose side, past a camping party in miniature, will course a glacier of real ice with a base of living pine and fir trees. The glacier is the product of electrical refrigeration. Tubs of brine, sunk beneath the miniature mountain, create rough, smooth, and piled-up ice. The top of the mountain and background are painted in oils. An intricate lighting system presents changing cloud effects and a realistic simulation of sunrise, sunset, daylight, and darkness. Motion pictures of vacation and touring scenes in the national parks are shown to the miniature tourists around the camp-fire in such manner that the spectators also may enjoy them. The Hoover Dam, greatest engineering feat of its kind, is represented by a faithful working model of dam, power plant, and its related works. It is built on the scale of one inch to thirty feet and is mounted against a diorama, a semi-circular back-drop that gives a realistic impression of a distant stretch of the Colorado River and a section of the surrounding sun-baked mountains of Nevada and Arizona. Water, rushing over the model, combines with shifting light effects to add reality to the spectacle. Another mechanical exhibit consists of six model groups mounted on an electrically-controlled revolving platform of steel, which represents important stages in our highway development. A miniature stage coach halted at a Colonial inn, models showing the race between the historic Tom Thumb locomotive and a horse, the first primitive wagon-roads of the log cabin era, the bicycle age, the advent of the motor car, the first improved highways, and our best transcontinental trails of today are features of this exhibit. The revolving platform, on which these scenes are shown, is synchronized with a series of mechanized maps so arranged that a highway map of the period always is visible with each related scene of the diorama. This impressive exhibit tells the whole story of our national highways and transportation from the beginning of work on the famous National Road or Old Trails route (now U. S. 40) up to the present time. Every motorist who visits the Century of Progress will be interested in the tests of streamlined models of motor cars in a dwarf-sized wind tunnel supervised by engineers of the Bureau of Standards. This portable wind tunnel, designed and built for display at Chicago, is twenty-five feet long and is equipped with an electric fan, with blades four feet in diameter, capable of producing a sixty-five-mile-an-hour wind. A cutaway section in the wind tunnel has been faced with glass so that the spectators can watch the tiny automobile models mounted in the range of the artificial air blast, and at the same time see the special devices and gages that record the effect of the wind on a moving motor car. One and one-half tons of steel have been delivered at the Federal Building on government order for tests in the jaws of a huge machine that reproduces the tests made for various industries by the Bureau of Standards in its Washington laboratories. Operated under electric control, a new automaton tests the durability of leather samples for use as shoe soles. The samples are mounted on a perpendicular, rotating wheel that moves at right angles to another revolving surface faced with emery dust. Through the angles and mountings of these wheels, the leather is subjected to the turnings, twistings, and pressures it would undergo if made into soles. Twelve samples are tested simultaneously on this machine. About 40,000 revolutions of the apparatus occur before the best sole leathers fail and crumble to mincemeat. Rubber soles, floor tile, and linoleum are also tested in this practical way. Another apparatus, recently perfected by the Bureau of Standards, consists of an electric recorder that tells how long paint, used as a protective coating on steel pipe, will last. The public will get its first glimpse of this automatic tester at the Century of Progress show. A bird sanctuary and game refuge constitutes another display, brilliant in natural coloring and so life-like that you watch attentively to see if the waterfowl, game birds, and wild animals are alive or mounted. This exhibit tells the story of wild life conservation and the federal stewardship of national timberlands. The attractive outdoor scene, looking as though it had been lifted bodily from some sylvan spot and moved indoors, is composed of trees and shrubbery so true to nature that you are amazed to discover they are artificial. Stuffed specimens of upland game birds perch in these trees. Artificial ducks, mouths distended as though uttering raucous cries, and feet outstretched for a landing, hang suspended over an imitation pond. One deer drinks at a cool spring-fed stream while his mate, head lifted, stands alert for any sign of danger. A wild turkey gobbler and several hens add a touch of American realism. This exhibit illustrates how Uncle Sam cooperates with the states in protecting and conserving wild life against poachers, parasites, and predatory animals. It also shows how timber is cut, replacement trees planted; demonstrates the value of tim-berland in conserving municipal water supplies and the importance of the forest terrain for live stock grazing. Through plate glass you can study the heart of an artificial redwood tree, a giant from the California forest. You can count the birthdays of that mammoth tree in the plainly visible rings of growth. The importance of forested areas that absorb rainfall and feed it gradually into the soil is demonstrated by an ingenious model in which pumped water percolates like rain through an illuminated channel. In one sector of this object lesson, the surface soil is bare and here the make-believe raindrops run away and go to waste. Another section, carpeted with grass, twigs, leaves, and matted debris, retains the water as it seeps slowly into the soil. A circulating pump, operated by electricity, forces the same water over and over through the restricted channels. Mothers, housewives, and their daughters will be interested in a home economics’ show visible through the windows of a three-walled home. Dining room windows will permit an inspection of the dietary problems of the average American family, solved by trained purchasing, seasoned selection, and skilled preparation of the proper foods. Through the living room windows they will be able to see parents hard at work balancing the budget. Another scene compares the wearing qualities of various textiles and show’s how to get the most for your money when buying clothes. Another striking exhibit, a real novelty to Fair visitors from inland places, will be a federal lighthouse, complete with beacons, bell buoys, sound signals, and radio outfits. How the flash and flicker of its powerful light guides storm-tossed ships to harbors of safety will be clearly demonstrated. The War Department’s share in the show will consist of a military encampment of 400 regulars, army maneuvers and daredevil riding by cavalry monkey-drillers, who equal the cleverest circus stars. The march of the infantrymen, the thunder of hoofs as the cavalry goes by, the blare of the military band, the precision of military formation, and small arms drill will give the visitor a glimpse of every phase of army life. The Army’s Corps of Engineers has made for the exposition a graphic bas-relief map of the proposed Nicaraguan Canal. Models showing proposed river and harbor improvements, and other similar activities of Army engineers, will be on display. The U. S. Navy will feature an intricate and effective demonstration. In its animated exhibit, an ellipse fifteen by twenty-one feet represents the ocean with the United States outlined by lights that flare or fade under switch control. The leading countries with which Uncle Sam trades are designated by colored lights. Tiny miniatures of freighters and ocean greyhounds, moved by electric motors, pass along the established ocean lanes between this country and foreign ports. Models of battleships, cruisers, and destroyers patrol the ocean, blockade strategic harbors, and go through the routine of war time precautions at sea. The animated spectacle, operating on a controlled time sequence, reproduces the activity of the Navy both in peace and war. For the first time in history, these stirring nautical maneuvers are fully reproduced in miniature. Another naval exhibit emphasizes the changes in design and construction that have taken place during the 150-odd years that have elapsed since John Paul Jones fought in sailing ships. Six models of sailing ships cruise a tiny sea, side by side with half a dozen modern battleships. Seaplane and plane carrier models, a miniature Akron, cutaway models of the latest marine engines, the development in ship propulsion and improvements in propellers, naval weapons, bombs, projectiles, airplane appliances, and safety devices complete the display. A REALISTIC model will illustrate the damage done by vast swarms of grasshoppers in a field of corn. An artificial grasshopper, thirty inches long, is mounted in the foreground and an illustrated text describes the insect’s life cycle and tells how the pest can be controlled. A full-scale reproduction of the interior of a modern ocean liner, equipped with the instruments and apparatus of the wheel room, offers a striking contrast to the model of the forecastle of a schooner of the type in use at the time of the Mexican War. An exhibit by the Census Bureau of the Department of Commerce consists of a large statistical chart which signals the increases in our population that occur at twenty-second intervals during a selected day. In addition, lights flash on and off to record the fluctuations in births and deaths, and in emigration and immigration. A battery of tabulating equipment will show how the census data are handled, counted, sorted, and tabulated by machinery. Puppet figures will re-enact the dramatic rescue work of the Bureau of Mines experts in mine disasters and demonstrate how first aid treatment is given to the injured. Airports and the network of commercial airways will be shown on a large electric background map. A full-sized radio beacon will be operated by remote control, and nearby the teletype machine, now used by the Weather Bureau and Department of Commerce in sending out flying weather maps, will be in operation. UNCLE SAM’S hundreds of exhibits will give a clear-cut idea of the far-flung activities of his scientists. There will be, for instance, a demonstration of finger printing as used in crime detection. A tiny reproduction of Old Faithful will show how a geyser works. In miniature, the visitor will see a modern live stock farm in successful operation. Models of coal and metal mines, of oil fields, of storage dams, and hydro-electric plants will supply a graphic picture of these giant industries. Paintings and models will show transportation methods in Alaska, salmon fishing, and gold mining in the frozen North, the cabin of an Alaskan trapper, and the garments he makes from reindeer skin. The accurate and world-wide methods of collecting and reporting crop conditions will be shown, along with the work of experts in solving problems for the dairymen of America. In an aquarium will be seen specimens of all our commercially valuable fish and the manner in which they are killed and packed. A mysterious old Mayan temple in the Yucatan jungle has been recreated as headquarters of the national exhibit of the Indians. Models illustrate the tribal life and surroundings of the Indians of the woodlands as well as the buffalo-hunters of the plains. Wigwams, tepees of bark and skin, adobe homes of the Pueblo dwellers, the earth-covered hogans of the Navajos are all faithfully reproduced. Another display depicts the arts and crafts of civilized redmen, their success in the trades and agriculture and their present self-supporting ability. The bill authorizing the participation of the federal Government in the Century of Progress exposition placed the work of creating and assembling the exhibits in charge of the Secretaries of Commerce, Agriculture, and State. Harry S. New, former postmaster-general, was appointed commissioner with Colonel W. B. Causey as assistant commissioner. Congress appropriated $1,000,000 to finance the national show. Approximately S200,000 was expended on the design and construction of the temporary Federal Building on the exhibition grounds while about $500,000 has been used in planning and building the exhibits that show what Uncle Sam does for the general public, and how he does it. The heck with the scientists’ conributions, how about them model makers! 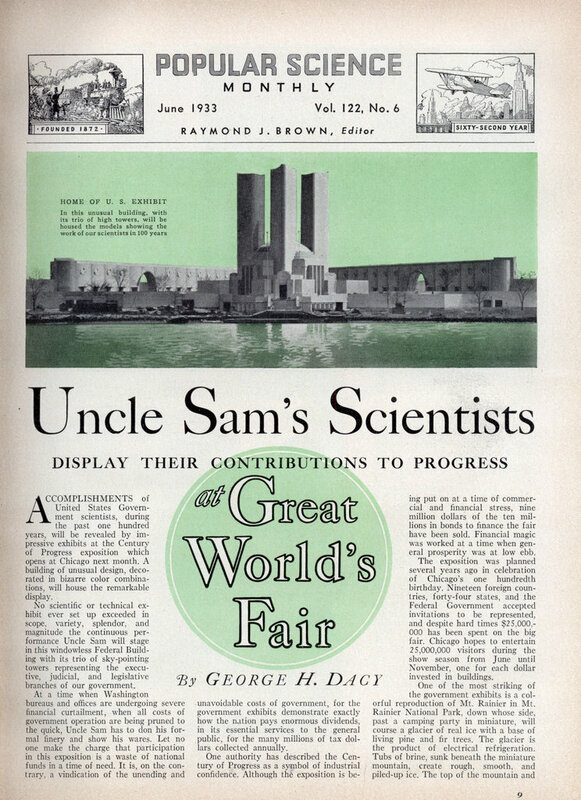 I love seeing articles about the World’s Fairs. I think I’d sell my soul to have gone to one of those – 1933 or 1939.